It struck me recently that I could try adding chicken, shrimp, or even tofu to my favorite Korean-Chinese salad recipe. And so I tasted it with chicken. It reminded me of another favourite salad, Vietnamese goi. Asian sauces and dressings really are the best. I never tire of the perfectly balanced flavours they impart. Should you try this refreshing salad, I believe you will be similarly convinced. In a small bowl, combine garlic, chili sauce, salt, vinegar, sesame oil, and 1 teaspoon sesame seeds. Pour over cucumber and chicken, tossing to coat. Chill for 1 hour or more. 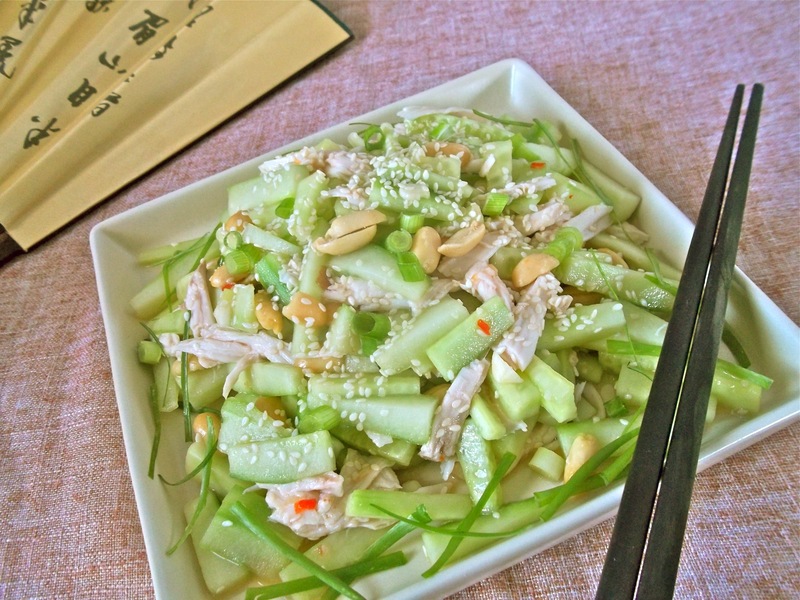 Shortly before serving, add spring onions, peanuts, and remaining 1 teaspoon sesame seeds. This recipe is linked to Tuesday Talent Show, AP Tuesday, Foodie Friday and Gluten Free Fridays. This looks delicious, perfect for a hot summer night. Thanks for adding your recipe to Foodie Friday! Thanks so much! I may have to come up with more recipes like this for days when it’s too hot to cook! Love the recipes and the images! Thank you!